GAPDH antibody recognizes glyceraldehyde-3-phosphate dehydrogenase, also known as GAPDH, peptidyl-cysteine S-nitrosylase GAPDH. The antibody has been extensively validated for western blotting using whole cell lysates. Mouse anti Human GAPDH antibody recognizes glyceraldehyde-3-phosphate dehydrogenase (GAPDH), a 335 amino acid multifunctional protein whose main function is to catalyse the reversible oxidative phosphorylation of glyceraldehyde-3-phosphate, in conjunction with inorganic phosphate and nicotinamide adenine dinucleotide (NAD). This reaction is an important energy yielding step in carbohydrate metabolism. GAPDH has also been shown to translocate to the nucleus under a variety of stressors, most of which are associated with oxidative stress, whereby it mediates cell death. A further report has shown that GAPDH binds to several proteins that are responsible for neurodegenerative diseases, such as amyloid precursor protein and huntingtin (Burke et al. 1996). Mouse anti Human GAPDH antibody recognizes human GAPDH as a single band of ~36 kDa by western blotting in a variety of human cell line lysates under reducing conditions. 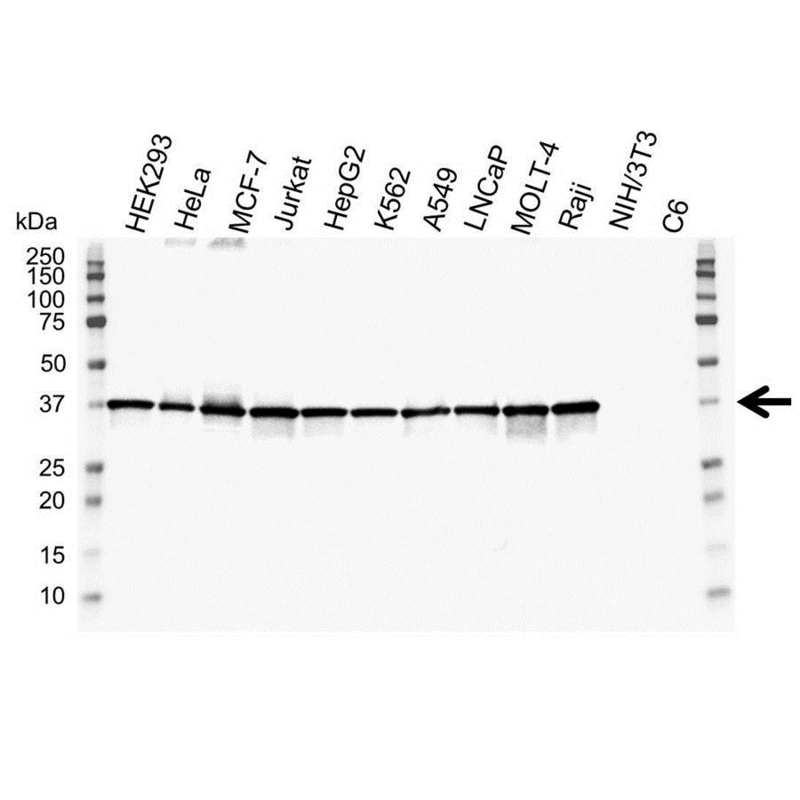 Anti GAPDH antibody detects a band of approximately 36 kDa in HEK293 cell lysates.